Fourth-year ultrasound majors Sarah Templar, left, and Raquel Schubert practice on new scanning equipment before starting their yearlong clinical rotations. Templar will begin her clinical experience this fall at Unity Health System Park Ridge, while Shubert will start at Borg &amp; Ide Imaging. The Center for Bioscience Education and Technology opened its doors in 2007 with the promise to stay at the forefront of bioscience education. That promise continues to be realized through the $2 million gift Excellus BlueCross BlueShield originally made to equip and maintain the building with the latest technology and to support the center’s academic and community outreach programs. The diagnostic medical sonography program has been one of the benefactors of the donation. “Excellus’ outstanding commitment to a high-quality education for future healthcare workers has made possible the purchase of nearly $200,000 worth of ultrasound equipment over the last three years,” says Douglas Merrill, the center’s director. Actually, her name is “Fiona.” Calling it “the simulator” got a little old, says Jodie Crowley, clinical coordinator in the diagnostic medical sonography program. The students quickly nicknamed the machine and Fiona has become an integral part of their training. “The simulator has let us move forward and gives students an exposure to what OB/GYN ultrasound is like before they get out to the hospitals and clinics where they begin working with real patients,” Crowley says. Sonography is a noninvasive diagnostic medical procedure that uses high-frequency sound waves (ultrasound), not X-rays, to “see” anatomy and blood flow inside the human body without the need to make incisions, explains Hamad Ghazle, director of the diagnostic medical sonography program. A complex process creates images from the sound waves that are sent into a patient’s body and bounce back. Students learn how to differentiate between normal and diseased organs and their appearances on ultrasound. Students also learn about the symptoms, the prognoses and management of such diseases. “We’re not only teaching students how to utilize high-tech instrumentation to create and interpret images from inside the human body and produce high-quality diagnostic imaging exams, but, also, we’re equipping them with the tools and skills needed to provide quality care for the healthy and critically ill patients, to be an integral part of the health care team and be life-long learners in a rapidly growing health care profession,” says Ghazle. Proficiency in performing ultrasound exams requires a considerable amount of practice. In addition to Fiona, the on-campus Ultrasound Scanning Suite has at least eight scanning stations, including three new machines worth nearly $140,000. Class sizes are limited to 14 to 16 students and the machines get a workout. During the academic year, more than 50 students will use the equipment Monday through Friday, as well as on the weekends. The latest-generation ultrasound scanners upgrade the facility, replacing some of the old analog equipment. The laptop-sized machines share space with 350-pound behemoths built in the late 1990s—the contrast displaying the evolution of technology. Besides taking up less room in the lab, where space is a concern, the new machines are portable enough to take along on recruitment trips to high schools. More importantly, they surpass their predecessors in performance. The ultrasound scanners are designed to adjust for different body types and expose students to a technique called “harmonics.” Not an option in the older scanning equipment, harmonics improves the quality of the image by sending out ultrasound waves with one frequency and “listening back” at different and multiple higher frequencies, Crowley explains. “Among other ultrasound technological advancements, such as live 3-dimensional technology, the introduction of this new processing technique has revolutionized the field of ultrasound and provided significant impact in the care and imaging of the difficult-to-image patients as well as image quality and diagnostic confidence,” adds Ghazle. Software purchased with the three new machines will also support a certificate program in echocardiography (scanning of the heart) currently under development. The program will tap into the expertise at Rochester General Hospital, which has a nationally recognized clinical cardiac division. 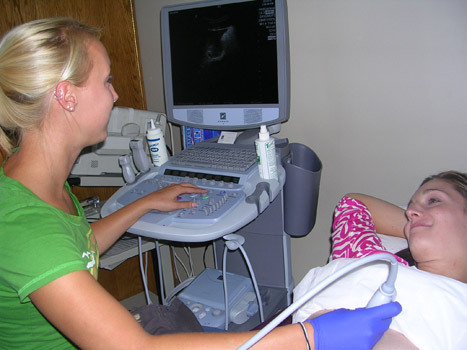 “RIT was the first university in the nation to offer a bachelor of science degree in Diagnostic Medical Sonography. The gift from Excellus BlueCross BlueShield has given us the ability to purchase expensive, cutting-edge scanning technology that will ensure that this RIT program is not only the first, but also the best in the nation,” Merrill says.